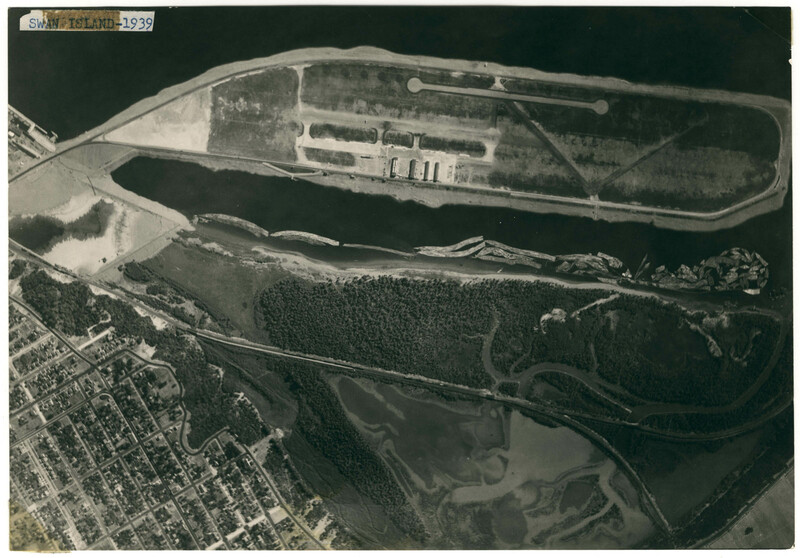 Portland’s rudimentary Swan Island Airport is clearly illustrated in this 1939 top-down photo. It was common in those days of unsophisticated instruments to paint the city name on a roof so early pilots knew they had the right (or wrong) airport. Except for rail lines, Mocks Bottom appears to be completely undeveloped at this time. 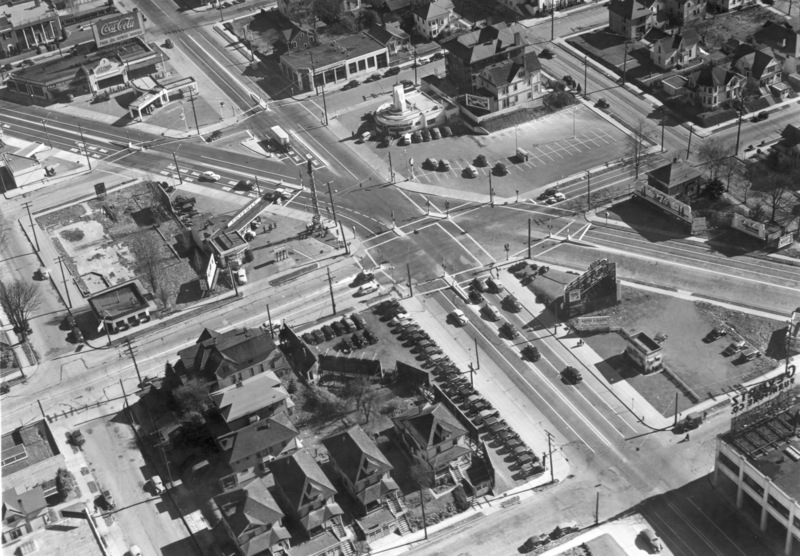 There’s much detail to pore over in this 1937 aerial view of the intersection of NE Sandy Blvd. and 33rd Avenue. This view is to the northwest. 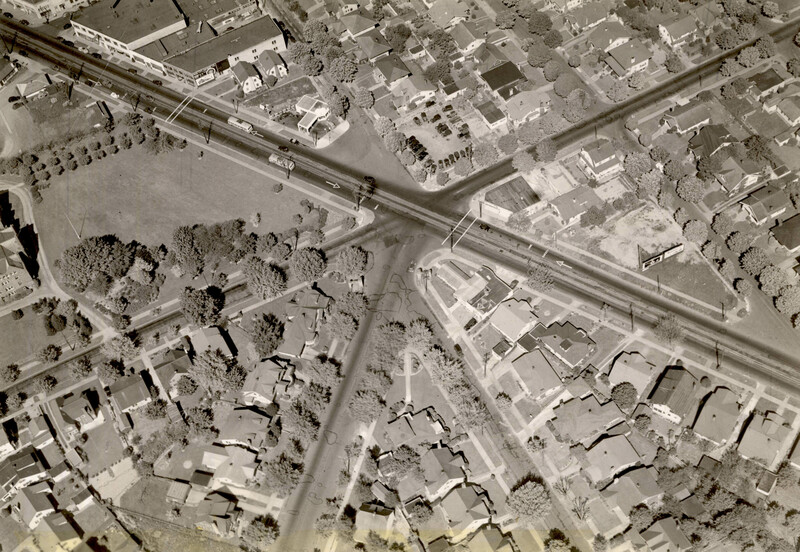 Posted in 1930s, 33rd Avenue, Aerial, Northeast, Sandy Blvd. Tagged Aerial, Historical Photo, Oregon, Portland, Sandy Blvd. 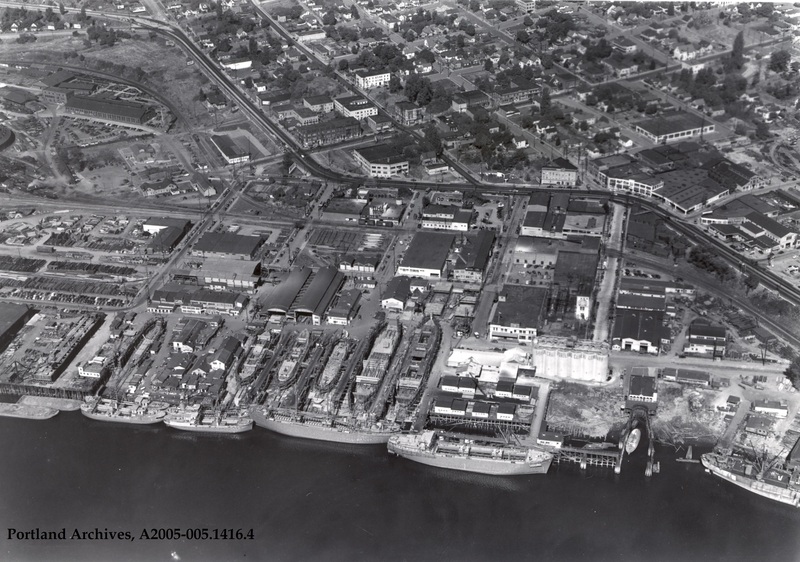 This is a fairly well-detailed aerial photo from 1947. West Burnside cuts through the center from about 22nd Avenue at the bottom to 10th at the top. This was before I-405 sliced through Portland and gives a decent view of a few of the blocks that were lost. Multnomah Stadium (Civic Stadium/PGE Park) is prominent on the right. 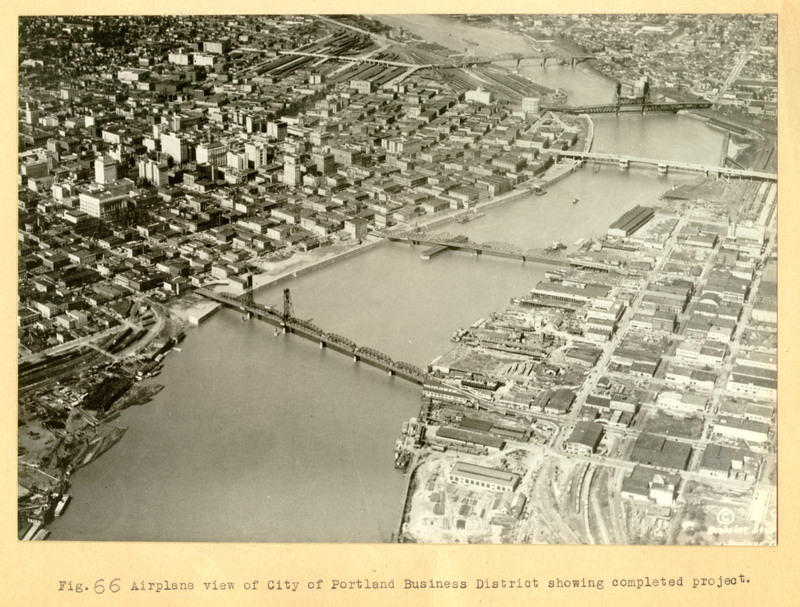 Portland is showing off it’s just-completed westside seawall (and intercepting sewer system) in this 1928 aerial photo. Two weeks ago, in comments about the Burnside Bridge and the Bridgeport Hotel, discussion centered around Baloney Joe’s, the shelter at the east end of the bridge. This 1939 photo shows the building that would eventually hold the shelter. The Bridgeport Hotel is at the top left and the future Baloney Joe’s building is the one-story building with arched windows next to it. 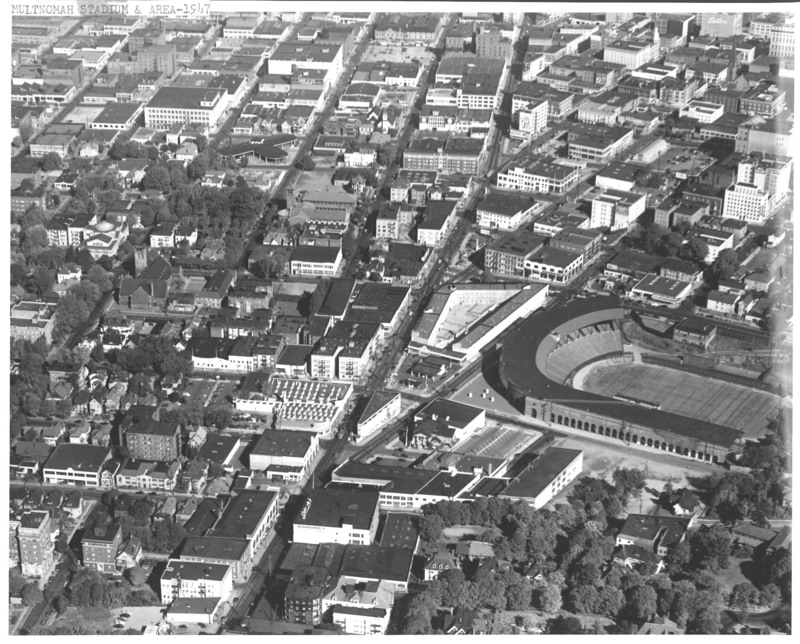 This view is northwest, with Grand and Union Avenues running top-right to bottom-center. The E. Burnside-Couch couplet is now open, simplifying this once confusing intersection at NE Sandy, E. Burnside and 12th Avenue. Traffic is now one-way east on Burnside (bottom-right to top-left) and one-way west on Couch (far left). 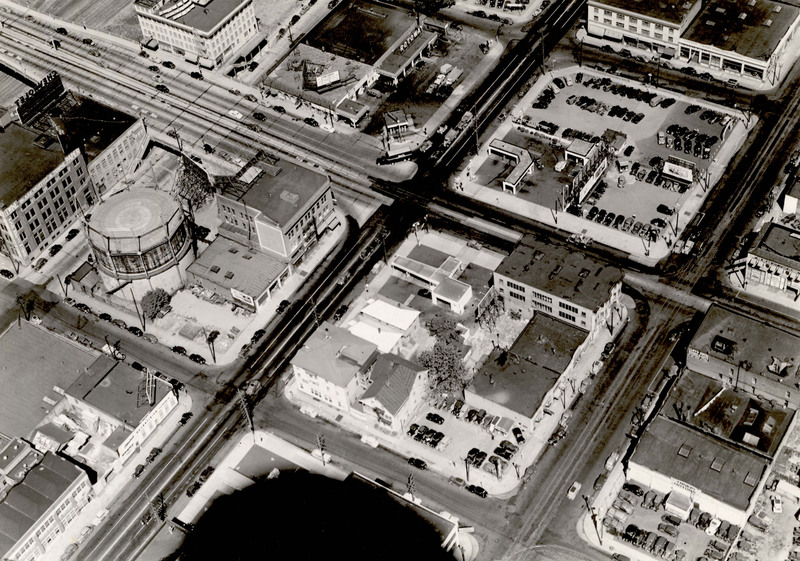 The beloved Tik Tok Drive In is at top-center in this 1939 photo.